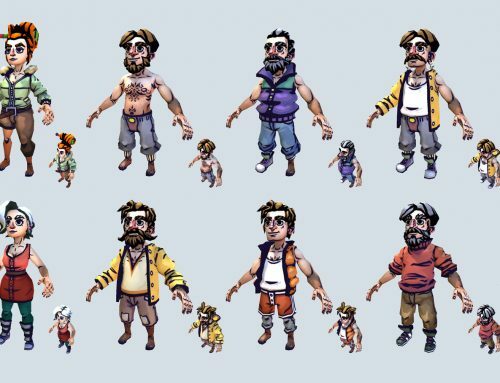 I’m Stan, the environment artist on Flotsam. In this post I’ll tell you more about the surrounding environment of your town, instead of focusing on the town itself like we did before. 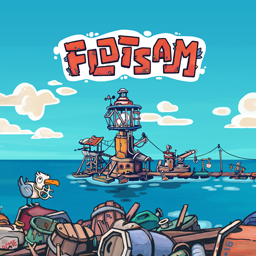 One of the defining aspects of Flotsam is probably the fact that your town is always moving similar to a huge floating island or boat. 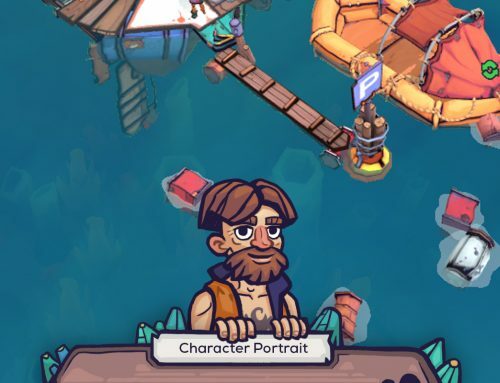 This makes the game different compared to other city-builders, where you usually have fixed places of interaction, like forests to chop for wood or blue crystals to mine for space dollars. In Flotsam anything interactable is constantly passing you. Examples of different points of interest. While moving around you encounter certain environmental features we like to call “Points of Interest”. All these points will either contain parts and materials to salvage or have creatures or people living near them that provide food and other things. You’ll have to act fast because your window of opportunity with each will be small, as you float by with your town. 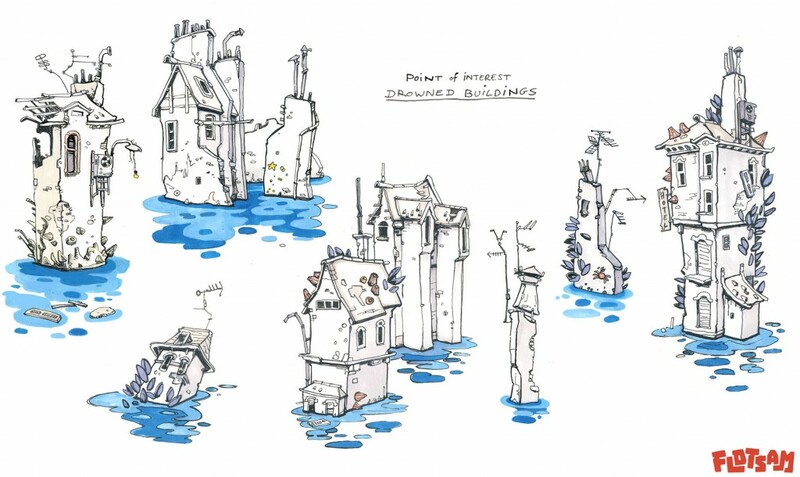 Houses could either be floating around or stuck on the ocean floor. These are mostly based on European architecture. 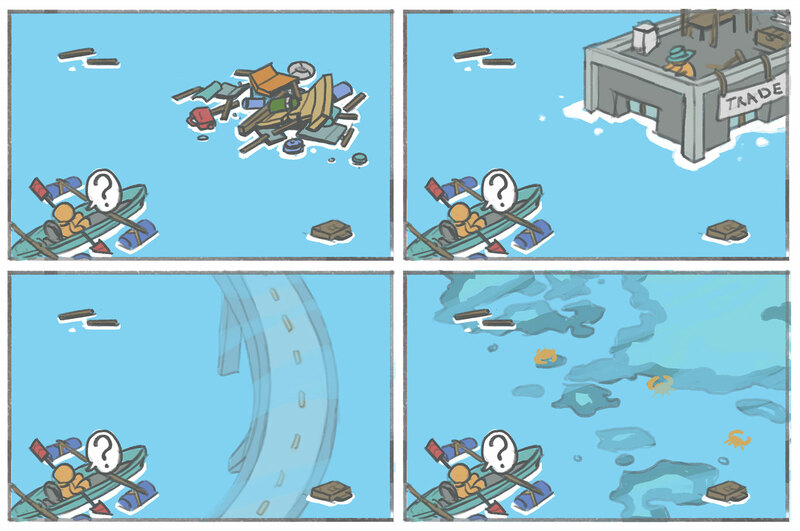 Because the whole world is flooded, most of the old world remains under water. But some locations still have features sticking out of the surface, like tall buildings. This old world is based on the world we live in today. 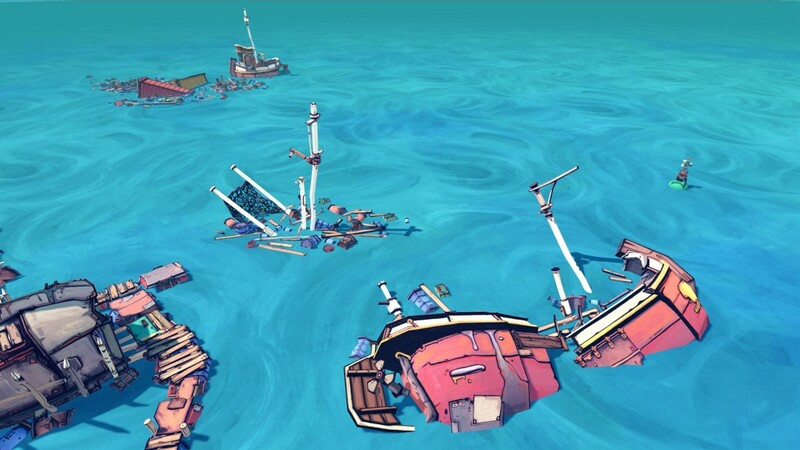 Because we want a big focus on recycling in Flotsam, there’s going to be a lot of garbage islands, wreckages of boats and other vehicles to salvage and even repair. We’ll tell you more about these later. Example of a few wreckages. The old world will occasionally be visible through the water in the form of cities and industrial areas. 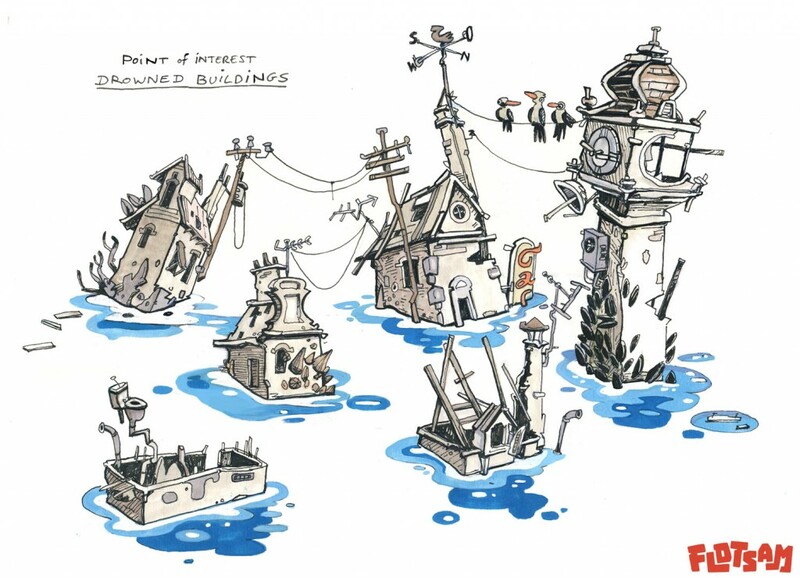 Some of them might even have skyscrapers, chimneys, pylons or viaducts sticking out of the water. Right now I’m basing these on European architecture. As we’re not really aiming for realism in Flotsam, I’m taking some creative freedom here by taking cool-looking older structures over structures that would actually be sticking out of the water like tall rectangular skyscrapers. All of these structures will show what the player can expect to salvage from them. For example, viaducts with vehicles will contain lots of metal and fuel. Urban buildings can have giant mussels growing on top of them which the player can collect, next to the usual scrap. If traders or refugees are located at a point of interest you’ll notice this by their boats, flags and lights. 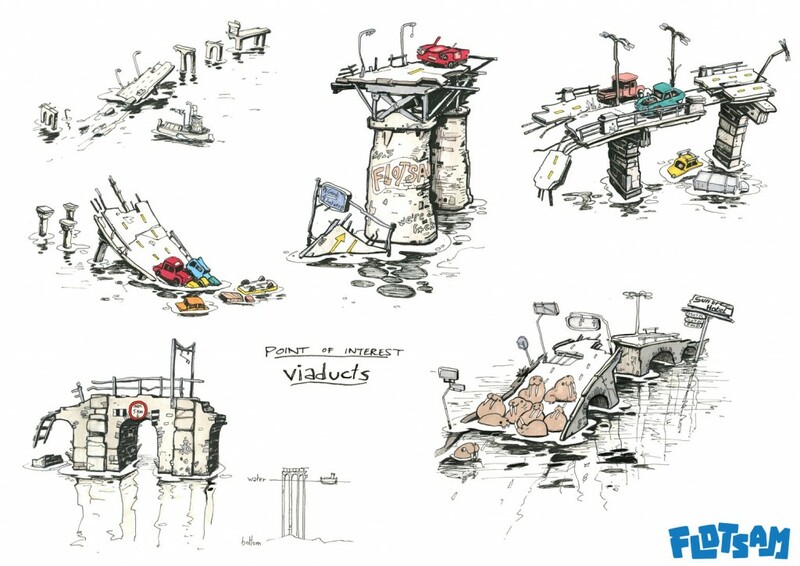 Viaducts could provide you with carparts, fuel and metal. Some animals could use them as “beaches” to live on. 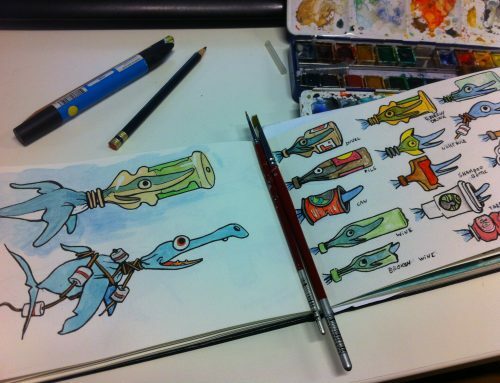 Art wise it’s a big challenge to make environments interesting for Flotsam. Even with some of the beforementioned features we’ll still need some variation in the environment to keep the player interested. A vast blue sea without islands could prove to be very boring after a while. 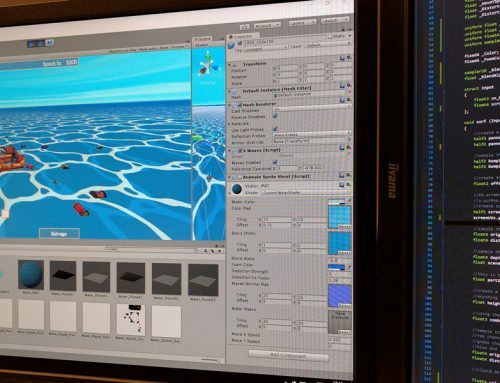 On the other hand designing the whole underwater world would take ages for only 1 environment artist. I’m currently thinking of testing out very low-poly and low-detail models to create the underwater cities, because these will be hard to see for the player anyway. Making them modular and procedurally generated shouldn’t be too hard when working with simple shapes. Subsequently I can put more time and detail into the surfaced features. I’ll share more about the art of these city features when I’ve tested things out and when I can show some actual 3D/in-game shots, in a later post. More European inspired buildings sticking out of the water. Your villagers can collect mussels that grow on the sides of these.